Just FYI for your future edits of /etc/sudoers: Don't edit /etc/sudoers directly. Edit it with visudo, which will check the syntax and help avoid this sort of problem. Of course, you'll still need sudo to run visudo. /etc/sudoers. The modified file will not be saved unless it is syntactically correct. To use visudo, you have to (horrors of horrors) use a root terminal and the command line interface. If you do not want to do such a thing, then you should not be fiddling with /etc/sudoers! As always, make a backup of the original file before starting to edit. /etc/sudoers is readable only by root. Open a terminal, enter 'sudo su', then 'visudo'. Visudo is a version of the vi text editor, which takes a bit of learning to use correctly. If you are not familiar, practise with its cousin vi before launching on visudo. Yes, it is not simple and user-friendly, but sudo and sudoers are serious matters and are not playthings - as you learnt the hard way. Also the familiar advice: print out and read the man pages for sudo and visudo before playing with fire. And if you haven't got visudo on your machine, get it from the repository. I just curious why entering recovery mode doesn't need login password? 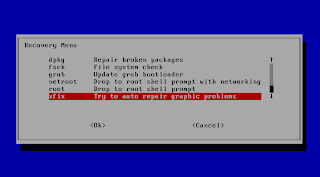 Can we configure it so that everytime we drop to root shell it prompt us with authentication login? @Tedy: Yes. You set your root password. I would not recommend doing this, however (1), as it may provide a false sense of security. 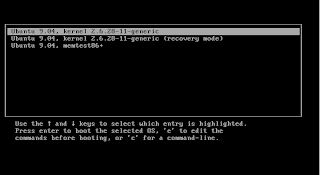 The root account is disabled by default, and for good reason, as it deters people from logging in as root (2); "recovery mode" is only accessible when a user has root access or when a user has physical access to the system and can choose the option via grub. Setting a root password makes it easier for an attacker who does not have physical access to gain root privileges (3) when your system is running normally (i.e. not in recovery mode). 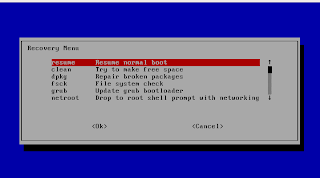 That said, if you want another way to deter people from logging in as root from recovery mode, you can set a grub (4,5), bios, or hard drive password, which would prevent access to any boot options in the first place. You would have to type in a password every time you boot your computer, though. and after that my screen just went off...giving a comment of "low frequency"
I have gone to the recovery mode but cant find the solution by going to the menu of"restore Graphics"
No need to "sudo su ; visudo" Just "sudo visudo"
Once I have the 'recovery screen' up, how do I navigate it? How do I select an option and execute it? My screen just goes dodgy whenever I try pressing any buttons. Thank you, it helped me. To start the virtual machine in recovery mode I had to press Shift instead of Esc, though. From Ubunto recovery i have no words to say his awesome work.Again a usefull and reliable recovery that you've published.Thank you so much for this kind of information!